Robert A. Weigand, Ph.D., is Professor of Finance and Brenneman Professor of Business Strategy at Washburn University in Topeka, Kansas, where he teaches Financial Management and Applied Portfolio Management. Dr. Weigand has also been a faculty member at Texas A&M University, the University of Colorado, and the University of South Florida. As the author of over 40 scholarly articles and book chapters, Dr. Weigand’s research has supported a variety of innovations in asset management, including Russell Investment’s CrossVol(TM) Volatility Indexes. 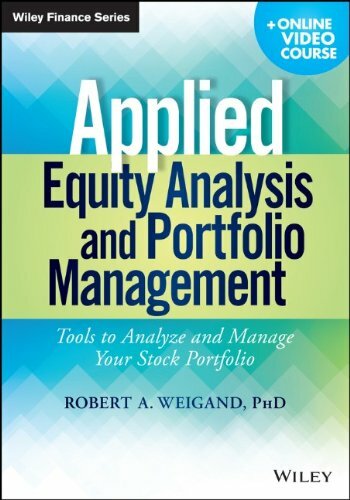 His first full-length book, Applied Equity Analysis and Portfolio Management, is scheduled for publication by John Wiley & Sons in January 2014. Dr. Weigand serves on the Harvard Business Review Advisory Council and as a Panel Member for McKinsey Quarterly. His blog, Financial Market Commentary, is syndicated by financial media outlets such as Wall St. Cheat Sheet, and has been recognized by Bisk Education’s CPA Review as a Top Accounting Education Resource and by Future Advisor as a Top Unbiased Blog. Dr. Weigand has been a recipient of the Ned Fleming Award for Excellence in Teaching (2011), the A. Roy Myers Award for Excellence in Research (2010), the John and Betty Dicus Excellence in Teaching Award (2010), the Kaw Valley Bank Excellence in Research Award (2009), and the Student Life Achieving Excellence Award (2009).